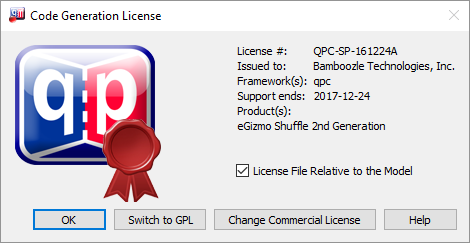 Every QP commercial license comes with the QM License Certificate file, which stores the commercial license information for the QM code generator. The QM License Certificate file is always named exactly the same as the corresponding commercial license. For example, a commercial license with the license number QPC-SP-161207A will be accompanied by the license file named QPC-SP-161207A.qlc (extension .qlc). The QM License Certificate file is specific to the commercially licensed QP framework type and therefore it is highly recommended to store it in the directory, where you installed QP. For example, if you installed the QP/C framework in the directory C:\qp\qpc, you should copy your QM License Certificate file to this directory as well. The strong cryptographic hash over the contents of the file, which prevents tampering with it. The QM License Certificate file must be registered in QM by means of the Code Generation License Dialog Box. The file is specific to the model file and different models can have different QM License Certificates associated with them. In other words, you can have multiple QM License Certificates present on your machine, associated with your various models (e.g., License Certificates for different Single Products of your Company). If you are interested in evaluating QM features available only with commercial license (such as generating code with the QMsm state machine implementation strategy), please submit an evaluation request using the no-obligation License Request Form. Evaluation licenses will be granted very liberally.